Detailed below are the instructions on how to edit your user profile on the ATLAS Directory app. These instructions are for general member users of the app. If it seems like options are missing or that the app isn’t working, it may be a technical issue. Email ATLAS at atlas-apps@illinois.edu for additional support if the guidelines below don’t answer your question(s). Returning Visitors will edit their information using the "User Profile Tab"
To edit your user information, such as name, title, office address, phone, url, etc, under the 'User Profile' tab, click the 'User Information' link. Information updated on this page is reflected across all your affiliated departments on ATLAS Directory. After updating your information, you MUST click 'SAVE' button at the bottom of this section. Title (Dr., Mr., Mrs., etc. ): This optional field will update your title information. (Dr., Mr., Mrs., etc). Do not insert your appointment (e.g. professor, assistant professor) into this field. Given Name (required): This required field will update your first name. Middle Name: This optional field will update either your middle name/initial. Surname (required): This required field will update your last name. Suffix (Phd., MD, etc. ): This optional field will append a suffix to your name. Appointment Title (Associate Professor, etc. ): This field will update your appointment title. Your appointment title is your faculty role in the college (e.g. professor, assistant professor, instructor, lecturer, associate professor). Do not place departmental specific, administrative titles, or support staff information into this field! Primary Office Address: This field will update your default office address. This address, by default, will be inherited by each department you are affiliated with (once you insert your departmental affiliations) unless you specify otherwise. A typical format for an office address would be "243 English." Please avoid the use of the word "building" in your description. Website URL:This optional field will allow you to include a URL of your choice on your user profile. Primary Email Address: This field will update your e-mail address. For consistency and to comply with the changes in naming conventions across campus, please use your @illinois.edu e-mail address. At the bottom of the 'User Information' page, there is a section for User Photo. If a photo doesn't exist, you can upload one or load from campus directory. If one already exists, you are able to delete it. If you have an existing CV/Resume file in a format that would be suitable to upload, you can add it to your profile, too. This can be done in the 'User Information' section, at the bottom of the page under all of the personal information. The Additional Information section can be found in the User Profile section, under the Additional Information section. Some or all of this section may not be visible to all users. This is based on various factors such as your department affiliations and permission levels. If it applies to you, you will be able to add Office Hours, links to External Sites, list Awards, Grants, among other things in this section. The fields that you are able to edit may vary, so not all of these fields may apply to you and your profile. 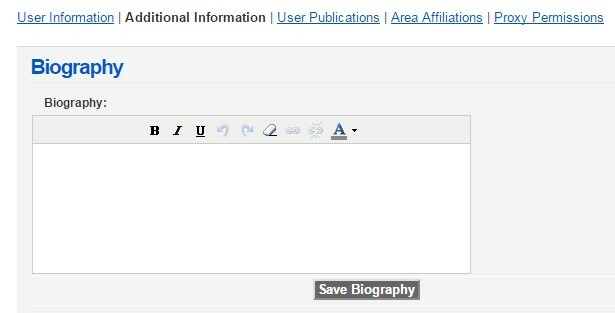 Under the additional information tab, you can copy and paste existing biography text. The easiest way to use this section is to type of the specific bio info you would like to include in an external program such as Word. In Word (or other external program) copy the contents. Once you have copied what you like, then paste it into the Biography text box. Review the contents to be sure everything appears correctly. Make any minor adjustments you need here. Each of these sections provides a way for you to enter lists of information to appear on your profile. You individually add each item you wish to include for that section. Type information in the appropriate text box. The Publications section can be found in the User Profile section, under the User Publications section. Here you can add publications to your online CV by choosing the type you wish to add and filling out the appropriate fields. Your pubs will then appear properly formatted on your profile. This system does require you to add publications one-by-one, but it takes care of the formatting and ordering automatically. Be sure to click the "Insert" button at the bottom of the page after finishing each entry. To Edit: Click the 'Edit' link for the row you wish to edit. Make the appropriate changes. Click Update. Note: You can easily view the 'Publicly Visible' box for each publication listed in the grid. The order of the publications listed in this section is reflected on the websites of any area affiliations. Depending on the publication type you are adding or editing, there may be areas that allow for multiple values to be entered. Such areas include Authors, Contributors, Resources, etc. Add the information for each one individually, then when ready click the appropriate Add Button (such as 'Add Author'). Do this for each item (i.e. Author) to add. The Area Affiliations section can be found in the User Profile section, under the Area Affiliations section. The area affiliations page allows you to account for split appointment by associating a department member (i.e. faculty) or yourself with multiple areas (or departments). If you do not have area affiliations, it simply means you are currently not associated with any resources that use ATLAS Directory. You may only edit or remove existing affiliations. Only Department Managers have the ability to add affiliations. If you remove an affiliation, you will not be able to re-add it. Hit "Edit" next to the area affiliation. Check/Uncheck the 'Visible in Directory' box. Choose the role(s) you wish to include, as well as the title for each, some titles are required. Once you are done with the all editing, make sure to click the "Update" button at the bottom of the page. * This action cannot be undone and you will not be able to re-add the affiliation. By giving someone else proxy permission, you allow them to edit your profile information for you. If you need help finding a NetId, there is a link which allows you to lookup someone in the campus PH system. Individual and Area Proxy Permission will each show up in their appropriate grid. To delete a selected record, click the 'Delete' link next to that record in the grid. To edit a selected record, click the 'Edit' link next to that record in the grid. Make changes, click 'Update' button.